Purpose : The purpose of this study was to examine the following two issues in elementary schools that appoint teacher librarians : how securing time for school library duties affects both the level of library services and utilization of school libraries ; and how different arrangements of teacher librarians' time for library duties as well as different employment arrangements of school librarians affect the level of library services and utilization of school libraries. 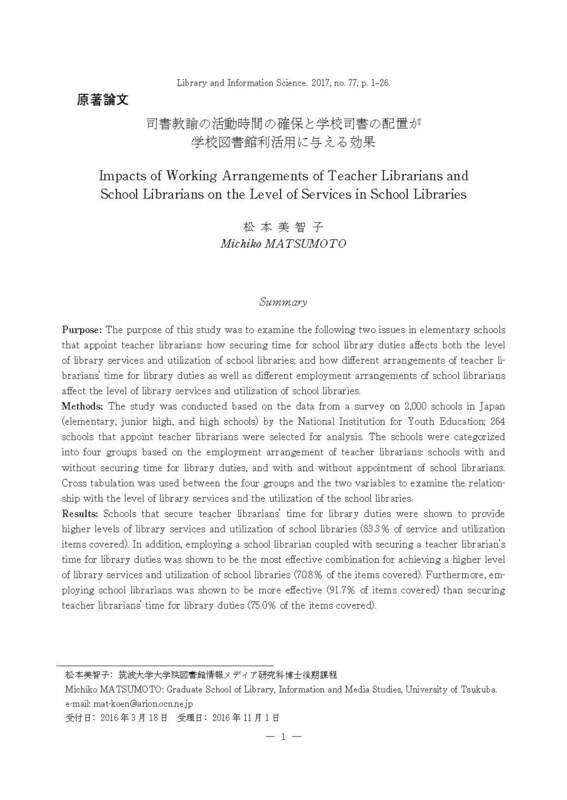 Methods : The study was conducted based on the data from a survey on 2,000 schools in Japan (elementary, junior high, and high schools) by the National Institution for Youth Education ; 264 schools that appoint teacher librarians were selected for analysis. The schools were categorized into four groups based on the employment arrangement of teacher librarians : schools with and without securing time for library duties, and with and without appointment of school librarians. Cross tabulation was used between the four groups and the two variables to examine the relationship with the level of library services and the utilization of the school libraries. Results : Schools that secure teacher librarians' time for library duties were shown to provide higher levels of library services and utilization of school libraries (83.3% of service and utilization items covered). In addition, employing a school librarian coupled with securing a teacher librarian's time for library duties was shown to be the most effective combination for achieving a higher level of library services and utilization of school libraries (70.8% of the items covered). Furthermore, employing school librarians was shown to be more effective (91.7% of items covered) than securing teacher librarians' time for library duties (75.0% of the items covered).